Kaby Lake processors provide Apple’s lightweight laptop a much-needed speed boost. Apple's third-generation Macbook offers a performance boost with Intel's Kaby Lake and lower prices. It’s now year three of the MacBook as we know it, and it seems that after initially being a laptop without an ecosystem, and then a laptop that we’re still getting used to, the MacBook has settled into its groove. 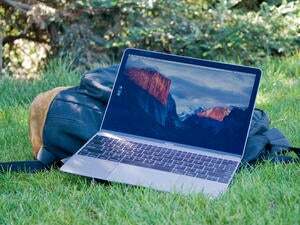 It’s established its place in Apple’s laptop line, and it’s finally gain acceptance by the consumer. But maybe you’re still a holdout. You’re out there, I know, still not convinced that the MacBook is a good buy. Well, I have some good news: The newest MacBook is a better buy than it has been, thanks to performance improvements by its processor and graphics upgrade. What Apple has in the MacBook is a small and light laptop that packs a nice speed punch. The speed increase is largely due to Kaby Lake, Intel’s seventh-generation CPU. In the $1,299 MacBook (which is the model this review focuses on), you’ll find a 1.2GHz dual-core Core m3 processor with Turbo Boost up to 3.0GHz, which replaces a Skylake (Intel’s sixth generation CPU) 1.1GHz dual-core Core m3 processor with Turbo Boost up to 2.2GHz that was in the 2016 $1,299 MacBook. Apple also offers a $1,599 MacBook, which has a Kaby Lake 1.3GHz dual-core Core i5 processor with Turbo Boost up to 3.2GHz. That replaces a Skylake 1.2GHz dual-core Core m5 processor with Turbo Boost up to 2.7GHz. The MacBook has one USB-C port. Invest in a USB-C hub if you want to connect multiple devices. The MacBook’s graphics gets an upgrade, too. It’s still an integrated graphics chip (where the graphics processor is part of the main CPU and uses part of a computer’s main memory); the Intel HD Graphics 615, to be specific. It replaces the Intel HD Graphics 515 from 2016. To top off the speed upgrades, Apple says that the solid-state drives in all of its laptops are now 50-percent faster than before thanks to an improved hardware controller. In order to see how much the speed of the 2017 MacBook has improved, we ran a set of benchmarks and compared the results to the previous MacBooks. 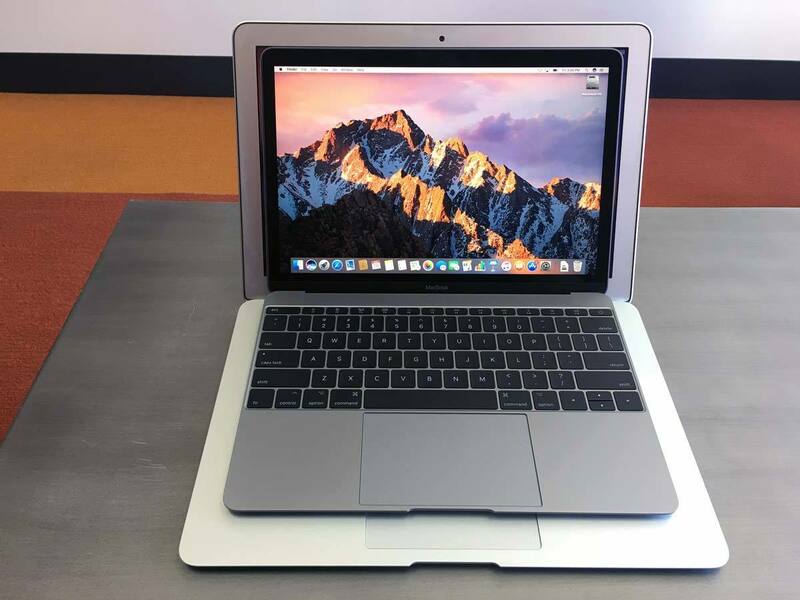 We also include a new 2017 13-inch 2.3GHz Core i5 MacBook Pro—the model that sells for $1,299 and does not have a Touch Bar, like other MacBook Pros. Results are scores. Longer bars/higher scores are better. Click to enlarge. The Geekbench 4 64-bit Single-Core test gauges the computer’s performance with CPU intensive tasks that require only a single processing core, like using a web browser, a spreadsheet, a text editor, or email. In this test, the $1,299 MacBook, with its Kaby Lake 1.2GHz dual-core Core m3 processor, surpassed the 2016 and 2015 MacBooks, to no one’s surprise. But what might be surprising is by how much. The new MacBook is a whopping 28 percent faster than the 2016 1.2GHz Core m5 MacBook. Against the 2015 1.1GHz Core M MacBook, the new MacBook left the old one in the dust, with a 63 percent improvement. As expected, the new $1,299 13-inch MacBook Pro was faster that the new MacBook, but only by 10 percent. To see how a processor handles multi-core tasks, like those performed by pro-level apps, we used the Geekbench 64-bit Multi-Core test. 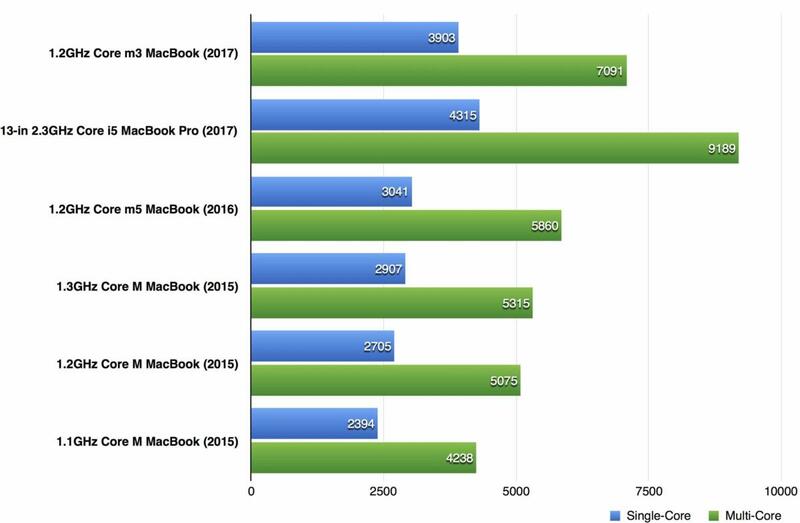 Again, we saw a significant speed gain by the new $1,299 Kaby Lake MacBook—compared to last year’s 2016 1.2GHz Core m5 MacBook, the new MacBook was 21 percent faster. The speed improvement compared to the 2015 1.1GHz Core M MacBook is definitely something to brag about: a juicy 67 percent. Results are frames per second. Longer bars/higher frame rates are better. Click to enlarge. All the changes to the new MacBook are internal. From the outside, the MacBook is the same laptop as it was last year and the year before. The aluminum body is available in Space Gray, Silver, Gold, and Rose Gold. The MacBook is Apple’s smallest and lightest laptop, measuring 11.04 x 7.74 x 0.52 inches and weighing just over 2 pounds. The 12-inch, 2304x1440 Retina display looks great, though I often find myself thinking that the display is a tad too small for my preference. I adjusted the Display settings to More Space, which makes the screen resolution look more like 1440x900 than the default 1280x800, but I found that while I liked having more desktop space, sometimes I’d find items on screen that were hard for me to see. A 13-inch screen, like the one on the MacBook Pro, seems to hit my tolerance level. The MacBook Air has a 13-inch screen, but it’s not Retina, so the image quality isn’t as nice. 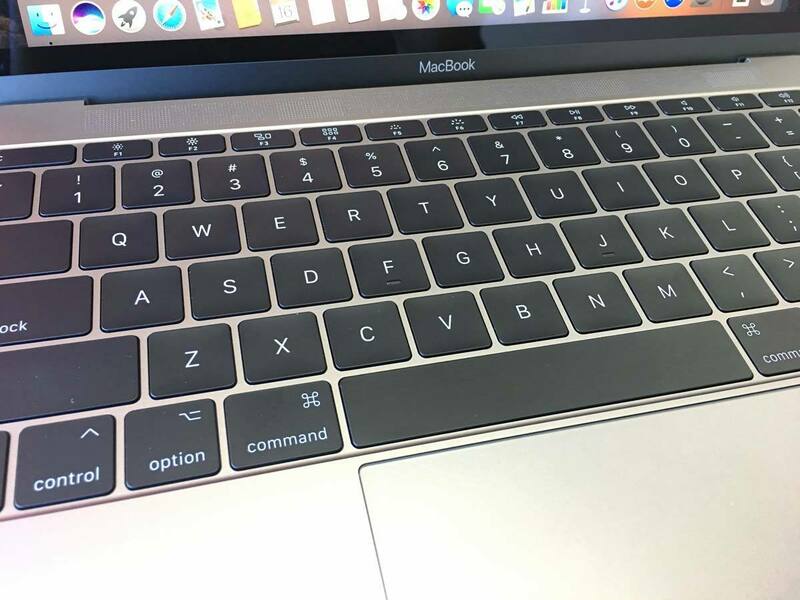 The 2017 MacBook still uses the butterfly-switch keyboard interduced two years ago. Then there’s the keyboard. Ugh, I do not like this keyboard, and it’s also on the MacBook Pro, so it’s not going away. For me, it’s too flat—I like keys with more travel and spring to them. It feels as though Apple wanted to replicate typing on an iPad on-screen keyboard as much as possible, without completely taking away any key action. Apple’s external Magic Keyboard, which uses stable scissor switches than the butterfly switches on the MacBook, feels more comfortable to me. The MacBook is small, and that’s great, because you’ll need some room in your bag for adapters and hubs. 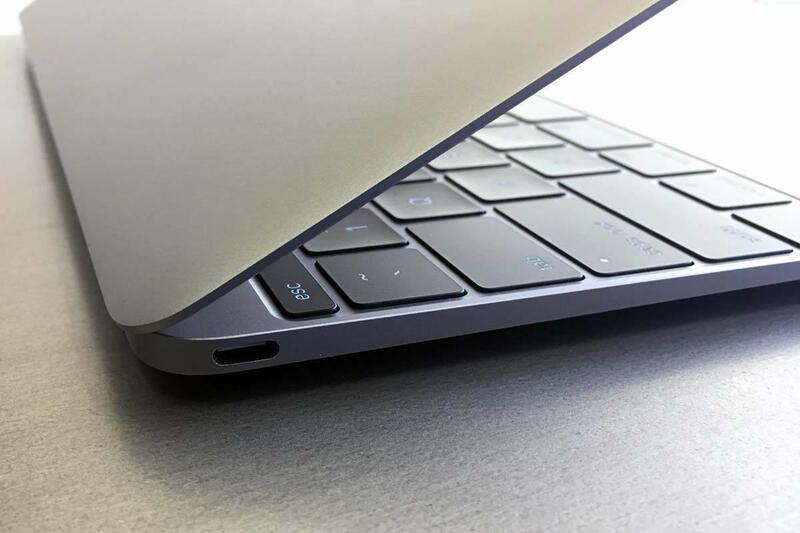 The laptop still has only one USB-C port, which could make connecting multiple devices to it a challenge. And since the single port is also the power adapter power, you’re really in for it if you need to charge, as well. It’s a good it to spend a few dollars on a USB-C hub, and one of our favorites is Dodocool’s DC30 7-in-1 USB-C Hub ($44.99 MSRP; $36 on Amazon). Otherwise, be prepared to rely on wireless connectivity for things like files transfers. The 2017 12-inch MacBook, sitting on a 13-inch MacBook Air. Like a lot of Apple products, it takes a generation or two before a new product line hits its stride. And the MacBook has hit its stride. Thanks to Kaby Lake, the new MacBook makes huge performance gains that make it a better value than when it was first released. This is a MacBook worth bragging about. If you own last year’s MacBook, you probably aren’t compelled to upgrade. But if you have a MacBook that’s just two years old, and you love (or are used to) the small form factor, it’s time to hand that laptop off to someone who can use one or sell it. The speed gains over the 2015 MacBook are tremendous and worth the money.